We know how easy it can be to neglect your advertising efforts when you’re rushing to get everything else done, which is all the time for most business owners. Therefore, we at Navigator Multimedia wanted to share our top 5 tips for Google marketing in 2016 so you know where to focus your energy. The foundation of your marketing should be based around your goals. Defining these goals and tracking them as conversions will reveal the effectiveness of your marketing channels, allowing for further optimization. If your marketing goals aren’t clearly defined, stop and define them right now before proceeding. If you’re ready to move forward with your Google marketing budget, let’s get into it. Google is constantly releasing new features and improving others, and we want to make sure you know about how these can be used to give you the best value for your ad dollars. Test every feature available and find out which ones give you a competitive advantage in your marketing efforts. Take advantage of features offered in Google Analytics to know exactly how many results your ads are driving. If someone asked you “Do you know how effective your search marketing is?” would you have a definitive answer? You should. With conversion tracking you’re able to determine whether your advertisements on Google search are resulting in actions on your site that provide value to your business. Whether it’s dialing your business number, filling out an inquiry form, or signing up for your newsletter, track it! A simple piece of code inserted on your site will follow users from the Ad they clicked through to each desired action. Find out where your dollars are going by tracking their results, down to each unique action on your website. Using Website Call Conversions allows you to account for each call driven by ads. When a user clicks your Google Search Ad, the code dynamically replaces your normal number with one that counts every call as a conversion, whether it was clicked to dial or manually dialed into a phone. Which keyword/ad combination led to a phone call! Collecting this information will better allow you to calculate your return on spending. The best part? Google provides the technology free with your Adwords account. Target people who are already interested in what you’re offering. Business owners know it’s easier to drive sales to those who are already aware of your business. With remarketing you can display your ads to an already interested audience: any user who’s browsed your site within 540 days. You can create messages aimed to entice them back using both Google Search and Banner Ads found across the web. For brands, use banner ads to simply reinforce your branding (ie. Coca-Cola). Canadian Jewelry Exchange uses Ads like this to re-engage with previous website visitors. Put every crucial piece of information about your business – locations, hours of operation, phone numbers, and reviews in prime real estate on Google. Many people are searching for your business on Google with basic intent: finding a location, a phone number, hours, and so on. You can list all of this information on more on Google My Business (formerly Google Places) by claiming your page and filling it out. Get this done as soon as possible to receive the benefits in both organic search and paid search (more below). 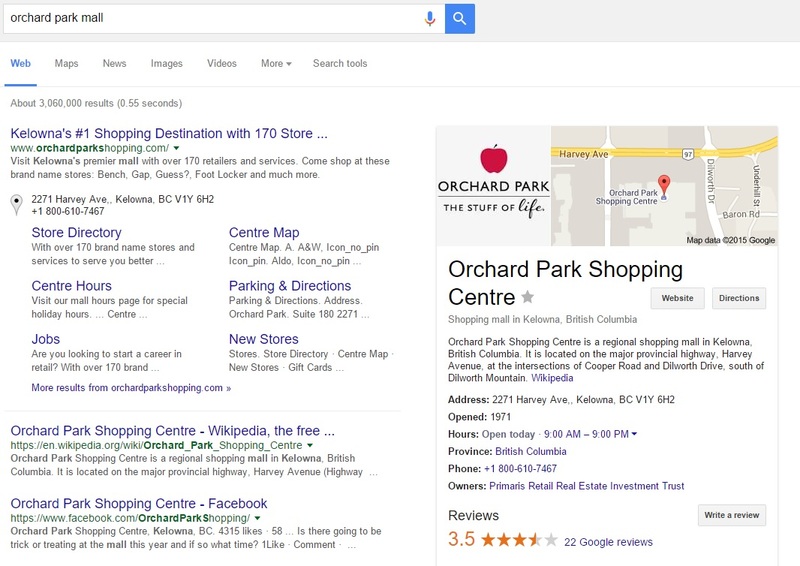 Information you’ve updated on Google My Business appears prominently next to results when users search for your business. Don’t let ineffective or stale ad copy waste your budget, and get more real estate with ad extensions! Adwords allows you to have various information added to your search Ads automatically. This means your ad takes up more real estate, which is what you’re paying for! Two of the most important are Call and Location Extensions, which respectively can add your location and its phone number, along with an extremely useful clickable call button to your ad. The best part about these are they can be added super easily by claiming and filling in your Google MyBusiness page and linking it to your Adwords Account. This is a tale of two ads: A business has paid for an advertisement to appear on a Google search and a person performing a search has taken the time to read it. The user wasn’t compelled to click through, and they moved along to the next result. The Ad that would have been clicked on was never actually created by the business. A tragic tale, no? The lesson is that as good as an Ad seems, it’s wise to consider the possibility there’s a better one yet to be written. Even basic Split-Testing will yield results. Set your Ads to rotate, create at least two Ad versions, gather information on their performance (this is where tracking conversions is extremely valuable), and evaluate a winner. Repeat for maximum results! These two ads have great copy and use Ad extensions. Extensions (all the information added below the first three lines) add credibility, give clickable phone numbers and store locations, and are far more likely to catch a person’s eye. They are configured by you and added automatically by Google to increase the likelihood of a click. Are customers showing off your products online? Make a hashtag to easily find user-generated content and engage with your best customers! Your business sells a product or service that customers are showing off to their friends online. How are you taking advantage of this in your marketing messages? The easiest way for you is to create a hashtag. Once your customers pick up on it and begin using it, you’ll be able to see content they’ve publicly shared. This gives you a great opportunity to interact with them and build that relationship further. Hashtag marketing provides a channel for businesses to find some of their most loyal customers, and engage back with them. Don’t settle for “Submit”. Drive conversions with convincing calls to action! Your website should be doing more than providing information; it should be driving valuable action for your business. In 2016 we encourage you to define goals for both your business and your website, then take action to meet them. Customers who visit your site need to feel desire to make that phone call or submit that form. Intrigue them with some mystery, encourage them with reassuring wording, or create a sense of urgency. Creativity will drive your best results yet in 2016. Square uses imagery, spacing, and a simple offer (“GET A FREE READER”!!) to entice users to take action on their site. 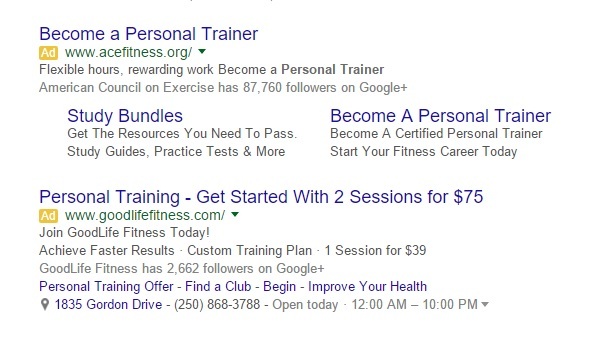 Got questions about your Google Adwords’ account health? Contact us today for a straight-forward, free account audit.